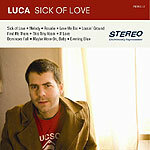 CD review: "Sick of Love"
Tucson-based power pop trio Luca (apparently expanded to a six-piece since this CD was recorded) has such a hook-filled sound, you keep expecting a sure-fire Top 10 hit to break out next track for sure. But while Nick Luca and mates churn out bright, radio-friendly song after song on their third album, "Sick of Love," that one can't-miss song is, well, missing. There simply is no "Pulling Mussels (From The Shell)," "Something So Strong" or "Stacy's Mom" here. The style is all there: Smoothly harmonized vocals, crunchy guitar leads, hypnotic beats that practically beg you to dance. And most of the songs are of the kind that Squeeze, Crowded House and Fountains of Wayne have used to craft such well-earned reputations as hitmakers. But power pop without the hits is only half the equation. Not to say Luca won't have that breakthrough hit that puts him in the same hallowed (and lucrative) territory as the above bands, but for now, this is an "almost but not quite" effort.